How much do I tell you about the plot of The Witches? I would guess that most of you have read it already, but if, like me, you have managed to live a The Witches-less existence for so long, how much do you need to know? I will tell you this: there is an unnamed young boy, and he’s our narrator. There is – typical Dahl – a tragedy early in the book. There’s the boy's wonderful and loving cigar-smoking Norwegian grandmother. There are witches: bald, toeless witches who want to rid the world of children. There are thrills and chills and humour and transformations, and there’s what I thought was a very original ending. There—I won’t tell you more. One of the many, many things I love about Roald Dahl is the fact that his stories are not tame. He’s not afraid to go there, wherever “there” might be. He’s wild, surprising, unlikely and slightly macabre, and that makes his books very satisfying on an emotional level. I feel this as an adult, and I’m willing to bet it's something children feel too. Some authors—and this includes authors I love—always feel safe. You know that there are things that would never happen to their characters. That doesn’t mean their stories are bad, or even predictable, but from the very beginning you manage to more or less guess their shapes and their limits. The rest is a question of details—and of course, details do matter. This, however, is not the case with Dahl. You feel that anything, good or bad, is possible in his books. And nobody, horrid or nice, is safe from anything at all. This is why I both was and wasn’t surprised with how things turned out in The Witches. He completely breaks the pattern, but that’s Roald Dahl for you. How do I say this without giving too much away? In most books in which a child goes through the experience this young boy goes through, the situation is reversed at the end of the story. Not so in The Witches, and I love it for that. For all you know, a witch might be living next door to you right now. She might even—and this will make you jump—she might even be your lovely school-teacher who is reading these words to you at this very moment. Look carefully at that teacher. Perhaps she is smiling at the absurdity of such a suggestion. Don’t let that put you off. It could be part of her cleverness. I can only imagine how much fun it must be to be a teacher reading this aloud to a class. Or a librarian! I think that if I were a librarian reading this, I’d take the liberty of replacing the word “school-teacher” with "librarian", just for extra fun. I wonder if it would work to replace it with “mom”? Now for the down side: another thing that is not uncommon when reading books by Roald Dahl is to come across uncomfortable bits. There’s the way the Oompa Loompas were originally described in Charlie and the Chocolate Factory, there are the traces of colonialism in Going Solo, and in The Witches, there are lines such as “There was something indecent about a bald woman,” just to give you an example. This is by no means uncommon in older children’s books in general, I know, but the reason why I react to it more strongly in Roald Dahl is because he’s one of my favourite authors. Does this happen do you too? Are you more demanding with books by authors you consider your favourites? Anyway, none of this is to say that children’s shouldn’t read Roald Dahl, or any other such silly thing. By all means they should read him, and enjoy him and laugh and be scared. But it’s also important to be aware of these things, to ask questions, to probe the story. Jane Yolen has a wonderful essay that deals with this in Touch Magic. I also found what the webmistress of the site RoaldDahlFans.com had to say interesting. To end on a positive note, because I really do love Roald Dahl to bits: The Witches is a wonderful book. I somehow missed out on it as a child, but I really think I had just as much fun with it now as I would have had fifteen years ago. This is not something I can say of every children's book. Also, reading it made me want to borrow Alice’s idea and have myself a Roald Dahl marathon. I am another The Witches-less person, though my oldest son loved it. He read this one and several other Dahl works so much the books have just about fallen to pieces. Interesting about the bald woman thing. Last summer I was talking to the boys about different customs in different places, and had just read in Out of Africa about a certain African tribe where the women though having hair was vulgar. My son piped up with a statement that bald women were ugly, and as soon as we got home, I sat them all down to show them pictures of bald women, some of which were very beautiful. He admitted it, too. It makes you wonder if lines like that played any role at all in his cultural conceptions. Not that I would stop him from reading or anything, of course. I'm so glad you enjoyed it, Nymeth! I'm pretty sure that this is still the favorite read-aloud the boys and I have had! And that really is saying something. I just couldn't get over the unique combination of "humor" and "horror"...it was absolutely delicious. So why have we not yet read any more of his books...yeah, good question. I love the point you made about the line about bald women. I have struggled so much with things like that in the past. For some reason Peter Pan sticks out in my mind as just making me thoroughly angry. But I've come to the conclusion that they really do just make for wonderful opportunities for meaningful discussion. Of course, this only works when we're reading together. But one certainly can't control, nor would I ever want to, everything that they will ever be exposed to in the world...I can only hope that we set a good example. And that we just keep talking. I missed The Witches in my childhood too. In fact, I missed Roald Dahl all together, and as an adult, I've only read his short stories. Clearly it's time I rectified that! I loved this book when I was a kid, although the movie scared me. Actually I loved everything that Roald Dahl wrote without exception. Looking back on them as an adult, I can see the "uncomfortable bits" that you mention. While objectionable, I think in part Dahl was a product of his time and the British empire. I've always planned on teaching my children that, along with a few history lessons ;), because I can't imagine a childhood without reading these books. Even if the man was not a wonderful person, his books are still lovable, and they offer an opportunity to teach our children about how people used to think. I hold my hands up and admit I have only ever read Charlie and Chocolate Factory. I was quite envious when Alice over at Hello I am Alice had a Roald Dahl marathon weekend and read six books over that time period. I may try to do that in order to catch up with them all. Oh, I would gladly go on a Dahl marathon with you! What a great idea! I loooooooove his books SO MUCH. Especially The Witches. And The BFG. And... well, all of them. Glad you enjoyed this. So creepy and wonderful. I love how the witches can't stand stinky clean children. Oh, I love Roald Dahl! I was re-reading him even before I had kids! Then came the kids' read aloud re-reads but you know, I'd like to re-read them again just to have reviews on my blog. I don't think I've read The Witches and I know I haven't read Esio Trot (I think it's called). As far as reviews on my blog, off hand I think I've only done James and Giant Peach and Fantastic Mr. Fox. Why don't you start a perpetual Roald Dahl project? Object: to read and review all his books...no time frame. I'd join fer shur!! As to insensitive phrases and words according to today's sensitivities, I'm not one to pay that any mind at all. Books are a product of their time and should be treated as such. Fifty, hundred years from now society will be thinking/debating the same thing about books written today. I love Roald Dahl's work but don't think I've read this one. I do agree that a lot of older children's literature does have some offensive things in it. Somehow I missed this Roald Dahl when I was younger. I read a lot of his other stuff, though. I will have to have a reread one day and read both the old and the ones that I missed! I would love to be a teacher and read this to a class :p I love that line! LOL. You know what I'm going to say don't you - how have you managed to live a Witchesless life? Did you read other Dahl when you were younger or are all his books new to you? I love Raold Dahl! I read all his books as a child and I can also tell you it is great fun to read to a class of 8 years olds! Great review! Roald Dahl is just so awesome! I have read The Witches, but it was such a long time ago, I can't remember what happens at the end exactly. But I know I loved it, as I loved Matilda, The Twits, and the BFG. I seriously need to get my hands on a Roald Dahl boxset! Amanda: I do think children's books do help shape cultural conceptions, but as long as conversations like the one you had with your son are had, no harm's done. In fact, they can help start some very interesting discussions! On a side note, I was thinking just the other day that I should really read Out of Africa. Debi: Reading this aloud must be SO fun :D Did you say "...or your lovely mom?" I wouldn't have resisted, lol :P And yeah, the combination of humour and horror is definitely one of my favourite things about Roald Dahl. I love Peter Pan, but I know what you mean. There's really no way around the racism. But you're right, they do create opportunities for some great discussions! Kate: I only started reading him in my late teens, and went through a big Roald Dahl phase. I LOVE his short stories! Meghan: You're absolutely right. The thing with Dahl is that the bits of prejudice we find are not at all clear-cut. The Witches doesn't portray women in a flattering way at all, but then you have the narrator's grandmother, who's a wonderful character. And his books tend to be about underdogs triumphing. One of the things I love the most about him is how he takes children seriously, how he always takes their "side", how he addresses the powerlessness they tend to feel. And in that sense, his books are quite progressive. Scrap Girl: All of them are quick and wonderful reads! They're perfect for a reading marathon. Violet: I hope you enjoy it! I had to get my copy online too. Benjamin: Thanks for the link; I'll take a look. Miss D: My favourite might be James and the Giant Peach, but I seriously love them all. And lol, the bit about not having baths was just wonderful. Nicola: Oooh, a Roald Dahl Project! I probably won't have time to put anything together in the next couple of months, but come July I just might. It'd be so much fun! And you're right, those things are part of history. That's why I think it's weird and a little dangerous when people mention wanting to "update" children's classics to rid them of disagreeable bits. Rather than trying to rewrite history, shouldn't we be discussing it? Bermudaonion: Do read this one! It's wonderful. And yeah, there's just no way around the racism and sexism in some older books. Kailana: Me too, actually. Like I was telling Kate, I discovered him in my late teens. But it's never too late! Chris: You must quit depriving yourself asap!! Read him, read him...you know you want to. Jason: I do! I LOVE his short stories for adults. You're right, they're definitely very Roald Dahl-ish. The Uncle Oswald stories are wonderful too. And EEK! What you said makes me want to NEVER watch The Tale of Despereaux. What have they done?? Because I've read the book, and believe me, it's really not like that at all! In fact, that sounds like the opposite of everything I like about Di Camillo's books. Anyway, I think it has and it hasn't changed. There ARE racist, sexist and homophobic books being written today. But fortunately people tend to be louder about those cringe-worthy things than they were in the past. There are children's books being written from every possible ideological angle, so I'm sure there are tons out there that would still make me cringe. And actually, The Witches isn't even THAT old... though I like to think that you probably wouldn't fine lines like "a bunch of evil females" thrown around as careless today. Then again, maybe I'm deluding myself :P Anyway, I think the same goes for fiction for adults, actually, but in children's books it just tends to be less veiled. Jodie: I know, I know. I spent a Roald Dahl-less childhood. I discovered him when I was like 19, and I went through a huge Dahl phase. But somehow I didn't get to this one until now! Alexa: lol, I can imagine the fun :D And yeah, no reason for children to miss out on them. Jo: Oooh, I would love a boxset! I need to get new editions of some of his books, actually. The ones I have are translated and it's just not the same. Especially the humour. I've only seen the movie - never read the book. I think I should. Love the review. Such a great review. I grew up on Dahl, and The Witches is one of my favourites. I think I enjoy the movie just as much, which is so very rare. Angelica Huston is so very very good in her role! Older books do sometimes have lines that make me raise my eyebrows. On the bright side, this really is quite a good sign of how far we've come, I think. Well I missed The Witches in my childhood too. I've actually never even heard of the author but I'm going to pop over to the good old handy-dandy library site and see if this book is there. Thanks for the review Nymeth! This was sooo good. And scary. I still look for women with gloves and get a little skeeved out when I do. 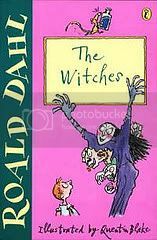 Sadly, I'm too long in the tooth to have read Dahl as a child but The Witches is one of my grandaughter's favourite books. We often have lovely discussions about Dahl's books - she loves Matilda too. The film of The Witches is quite good if you've never seen it. PS: and I totally agree with you that it's dangerous (and makes me kind of sick to my stomach) when children's books (or any books) are "updated", especially with the aim to make them more palatable. It's a shame when history gets swept under the carpet. I also really hate it when people underestimate children's abilities to distinguish fair/unfair, and when parents neglect to take the role of talking to their child about how they feel about certain parts of a story, and letting kids find their own way. Too much sterilization equals lack of imagination and conviction. I have this on my desk with good intentions to start. It's for the Dangerously Read Challenge (which for me, focuses on banned books). After reading it, do you know why it's banned? I'm with Chris and Melody...I've never read any of his books. Although I've seen both Charlie and the Chocolate Factory movies several times. And I just tried to place a hold on The Witches at the library and it told me "in preperation for a new catalog, holds may not be placed." Augh! I've read a lot of his juvenille books, but not very many of his short stories for adults. I love "Lamb To The Slaughter", though! My son, Chad, is a huge fan of Dahl. For me, I've actually never read any of his books. Seen some of the movies. Figure I'll get to the one day! As for holding the author to a higher standard because he's a favorite...I've done it too. A Roald Dahl-thon sounds like a great idea! I have only read a few of his and like you, never as a child. But I adored what I read, especially Matilda and James and the giant peach. Witches should be next, or Danny the champion of the world. With Witches, though, I'm afraid I'll be biased towards the witches. I mean, I LOVE witches, and I hate when they're portraited *only* as scary wicked women. But I guess this is Roald Dahl so it must be fun!! I think I'd be annoyed a little by those remarks you mentioned,but I too am ready to forgive him, so we'll see! I have read a few by Dahl, but haven't gotten to this one yet. It sounds like one more that I would love and could pass on to my kids. Thanks for the awesome review! I re-read this myself not too long ago, and I absolutely agree with your review. Roald Dahl does well what Lemony Snicket does okay. The ending made me cry, too. If you haven't seen the movie, I recommend it just for the actors in it. Love Roald Dahl. I didn't read The Witches until I was in middle school, because I had heard how scary it was, and by that time I was old enough that it didn't upset me unduly. But I do find Roald Dahl's stories a bit terrifying; for some reason, I find his children's stories a bit more alarming now that I've read his stories for adults. I have never read this book. I think I will need to take care of that little gap in my reading! I especially like the quote you included. Question for you: I've been thinking about reading some John Green and I know you like his books. Do you have a suggestion as to which book I should begin with? I do like Roald Dahl's books, but Witches is one I never heard of. I often come across lines in older kid's books that make me cringe- as a reader I just gloss over them, or appreciate how it places me in the time when those views were commonplace, but now when I read those books to my daughter, I pause and wonder what to do. Do I skip the offensive phrase? Do I verbally edit? (My mother did this- I didn't realize how many YA books she read to us had swear words until I read them again years later) or do I try to explain why the author would have said this not-nice thing in a book, to a kid who probably won't quite get it? I often opt with a or c, but it's difficult. Out of Africa was good, but a little dry. It took me several weeks to read, and I had to have something else to read at the same time. It was definitely one to take slowly. Ooh, I haven't read this in YEARS. Maybe I'll have to pull it out and read it again. I loved this book - and the movie, which totally gave me nightmares even though I loved it! You hit it right on the head, they are not tame at all. But they can be uproariously funny and no matter what are a complete pleasure to read. I remember going through a Dahl phase back in my early 20's when I was working at a bookstore and I read Witches at that time. I barely remember any of it, which means it is probably a good time to pick it up again. One of my favorite Dahl children's books is The Twits. Laugh out loud every time I read it and it is very fun to read aloud. I need to pick up Boy again and finish it. I've only read part of it. I recommend Dahl's adult short stories as well. Very different and yet oddly the same, if that makes any sense. It can be really disappointing when favorite authors say things that are politically or socially incorrect, or prejudicial, etc. I have a hard time with some of what Ian Fleming writes and yet I still really enjoy the Bond books. It has been so long since I've read Dahl that I didn't remember him being like this. I think what we have to do is judge intent, think about the time period when stuff was written, etc. At least as adults we can filter out those things we don't agree with and still enjoy the story. When it comes to kids reading these things I think that gives us an opportunity to discuss the past and present with them and help guide them towards seeing people as equals and as individuals to be cherished. Belle, thank you! I love Angelica Huston, so I must see the movie! And you're right...that they stand out so much today can only be a good sign. Sadako: It is scary! And funny and awesome. lol, I bet I'd have been checking all the time too. Cath: I haven't, but after so many recommendations, how can I resist? Miss D: Feel free to get on your soapbox anytime! I absolutely agree with everything you said. Christina: It's so strange that this book was banned! Maybe it was considered "too scary"? That's really the only thing I can think of. Melody: Yep...you should :P It would also be fun to read with your girls in a few years! softdrink: Grrr, stupid library site! I think you'll really appreciate Dahl, especially his sense of humour. Bybee: His short stories are brilliant! You must read more! Stephanie: I guess it's only human. And do read Dahl when you have the chance! Valentina: Matilda and James just might be my favourites too :) The Witches in this book are not portrayed sympathetically at all, and I think you'll frown at the portrayal of women in general...but there's definitely still a lot to love here regardless. BonnieBelle: I'll definitely have to see the movie! And yes, the ending WAS very sad. Especially when the boy asks his grandmother a certain question - I bet you know which I mean. Terri B: Hmm...I love them all, but most people prefer Paper Towns or Looking for Alaska to An Abundance of Katherines, so I'd say any of those too. They're all great, though, so you can't go wrong! Jeane: It really must be difficult to make that decision. I guess it depends on how old she is...a discussion/explanation probably wouldn't work very well with a very young child. But later on, it could make for an interesting conversation. Amanda: Thank you - I'll keep that in mind! Court: I so have to see the movie! Carl: I love his stories for adults! The man had a wild imagination - in a good way, of courses. The Twits is awesome, and so is Boy. I've yet to read a Dahl I didn't enjoy. And I absolutely agree - these things create opportunities for some very important discussions. I need to read this one, it seems to be making its way around the blog-o-sphere. I used to watch the movie over and over when I was little. It fascinated me. I'm glad you enjoyed this, Ana! Love your review. Feel free to borrow the Dahl marathon idea. LOL! And yes, I'm more demanding of my favorite authors. It is interesting to see how the things authors probably meant as being harmless years ago strike our awareness now. I remember thinking that once or twice while reading Mary Poppins. Love this book! It was the first Dahl I ever read and I couldn't count the number of times I've re-read it. Although I do notice the un-pc remarks in books, they don't bother me. It all relates to what was acceptable when they were written. And with every year that passes more things become unacceptable. I also find that a lot of children won't notice the negative implication/message until it's taught to them. A major drawback of teaching kids about racial/cultural prejudices, that may never be properly solved. Naida, it really sounds like I should look for the movie! Trish: Yes, I know the feeling! I love how his books evoke a sense of cumplicity with children...like they're a slightly ilicit shared secret. I haven't read Mary Poppins yet, but considering when it was written I bet it will be full of things that bother us today. Joanne: I know, it's definitely a matter of social context, but part of me can't help but go, "But he's Roald Dahl! He's meant to be perfect!" :P And you have a good point. But I think that in our society they will inevitably be exposed to prejudice sooner or later, so the first time might as well be in a context where it's being discussed. Thank heavens you finally read this one - I'm surprised you survived so long without knowing the ways of spotting witches. :-) Have you read any of Dahl's stories for adults? I haven't in years, but I remember a few disturbing things along the lines of the bald women comment. Still, I do adore him!